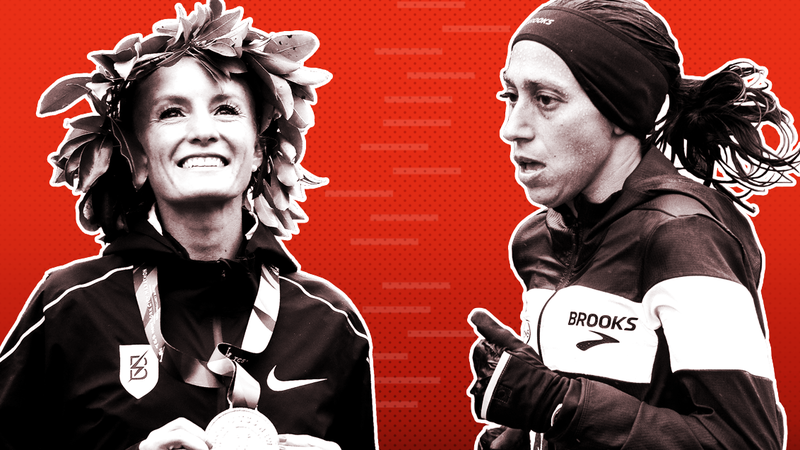 Desiree Linden and Shalane Flanagan have been fixtures in American distance running for 15 years, but they traveled very different roads to get to where they are. 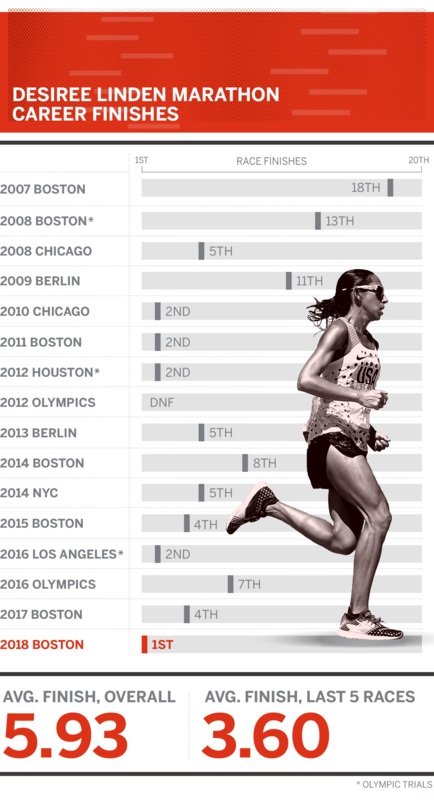 Linden, nee Davila, had a relatively quiet college career and progressed gradually at the 26.2-mile distance, bursting into mainstream consciousness with a scintillating stretch duel at the 2011 Boston Marathon. Flanagan was an NCAA champion in track and cross-country and an Olympian on the track who holds a silver medal in the 10,000-kilometer event. She was second in her marathon debut in NYC 2010 and has never finished outside the top 10 in a major marathon. Both have endured through lengthy injury layoffs and continued to challenge seemingly unassailable East African dominance to achieve their lifetime goals of winning a major title. Marblehead, Mass. Hometown Chula Vista, Calif.
Portland, Ore. Residence Charlevoix, Mich. It's no accident that Flanagan and Linden have excelled in Boston and New York, two so-called "championship" courses with undulating topography and, not infrequently, difficult weather conditions. 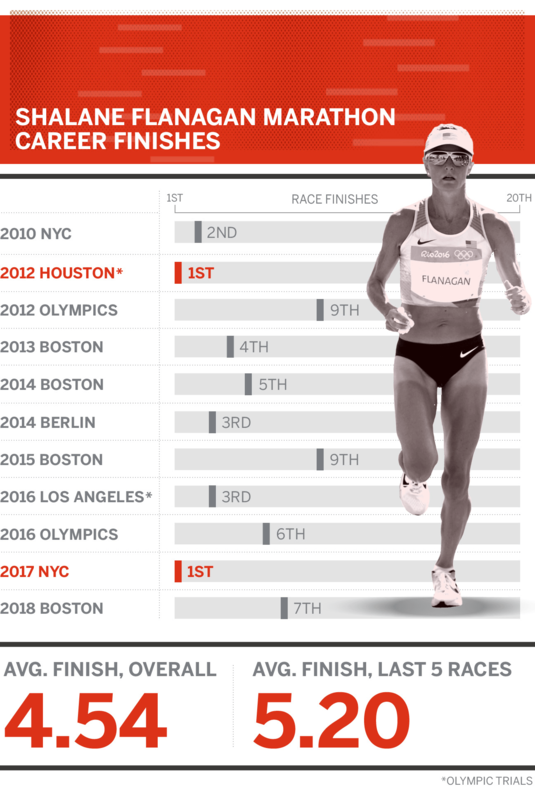 A few years have elapsed since the two women ran personal bests, but tactics and perseverance, rather than finishing times, have come to define their careers. Both have been outspoken about anti-doping and think they might be competing on more level ground than they did years ago. In marathons they've both started and completed, each has finished higher than the other three times. Linden: "I write a race plan, with pen and paper, often on hotel stationery. It's detailed. Maybe a page-and-a-half. Flanagan: "I go to the bathroom." Linden: "Burger, medium, with cheddar cheese and fresh jalapeno." Flanagan: "A burger and a beer." Linden: "Deena Kastor, even though I was too old to be a kid. I was more into soccer when I was younger and Michelle Akers was my hero." Flanagan: "This is going to sound cheesy and corny, but my parents. They were both runners." Linden: "'The Sun & The Moon & the Rolling Stones,' by Rich Cohen." Flanagan: "'The Passion Paradox: A guide to going all in, finding success and discovering the benefits of an unbalanced life,' by Brad Stulberg and Steve Magness [unpublished galleys, release March 2019]." Linden: "I'll go with my traditional choice: [author] Joan Didion." Flanagan: "My dad. His arches have collapsed, so his feet are terrible. It would be fun to run with him again. I think the last run I had with him was the 5K in Marblehead, [Massachusetts]."